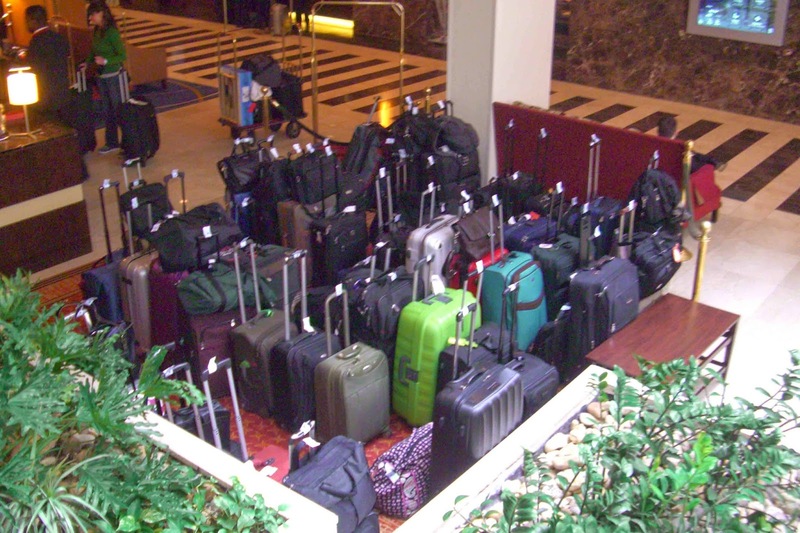 Hotels often have an overflow area where they keep the bags of those who arrive too early to check in or who have not yet left town. It's impossible for me to not anthropomorphize the bags left in a luggage corral. With perky, claim-ticketed handles, those bags seem eager to go wherever their owners will take them. The crayon-colored suitcases have a higher flamboyance quotient. Perhaps they contain metallic stilettos and sequined tops meant for day wear. What about all the plain black carry-ons and twenty-four-inchers? Do some of them feel insignificant, longing for a sparkly I.D. tag or strips of florescent pink duct tape? Or are they glad to blend in with the crowd, hiding in plain sight, keeping their startling contents under wraps?